ProjectA project is a top-level folder within Autotask Workplace. A project is the primary container for all the folders and files that are synchronized by the Workplace service. Projects create the basic organizational structure to store data and control user access. notifications are automated messages designed to alert you when particular events (like changes made by other users) take place in the projects with which you are associated. Notifications are designed to facilitate collaboration, but you can manage when and how they're sent. Your project notification options are listed below. System default selections are marked with a , but you can modify all selections. Modified notifications display a . File has been added or changed. Refer to File types that trigger notifications. Select the notification settings you wish to apply to projects by default. 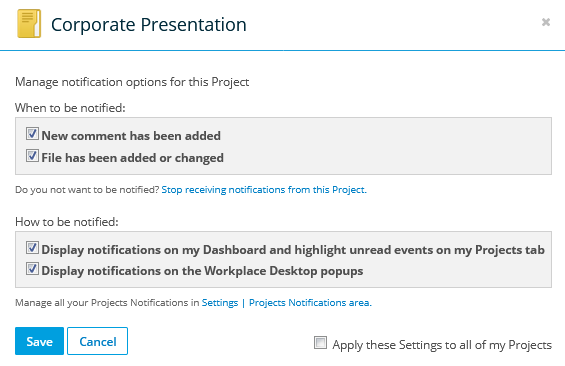 You can also enable or disable notifications for specific projects and access the Manage Notifications popup for specific projects from the lower part of the page. Click the icon next to the project. Confirm that you want to turn notifications off. To enable notifications, click the icon next to the project. 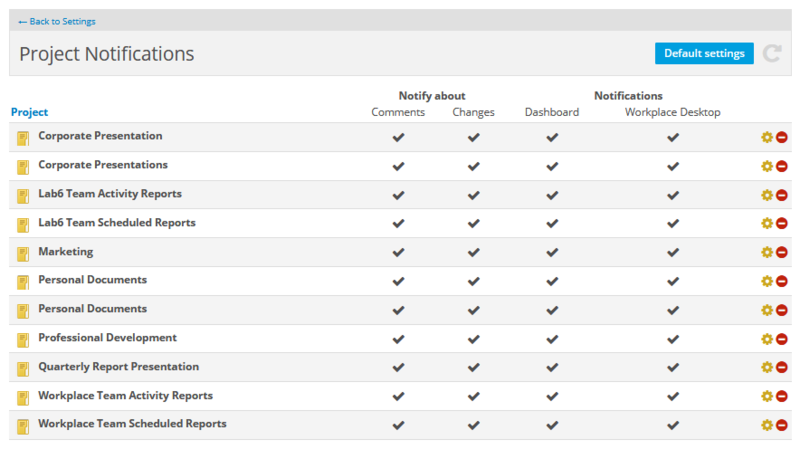 Select the notification options you want to apply to the project. Optionally, you can select the Apply these Settings to all of my Projects check box. Because this will override any settings previously used for all other projects, you will be asked to confirm your selection.